Marshall Seaver is being haunted. the pages of a sketchbook—a character Marshall himself created. Marshall has no idea why he is being tormented by this forbidding creature, but he is quickly convinced it has something to do with his best friend, Cooper, who has gone missing. Together with Cooper’s beautiful but aloof sister, Sydney, Marshall searches for the truth about his friend while ultimately uncovering a nightmare that is bigger and more frightening than he could ever have imagined. Number one New York Times bestselling author D. J. MacHale launches his eerie new trilogy with a story so packed with chilling suspense, readers will want to sleep with the light on. The voices grew louder, more urgent, as if they were running out of time. It sounded like gibberish. It was gibberish. I knew that. It was a dream, right? That’s what I told myself and it calmed me down. That is, until I heard a single word break through the haze as plain and clear as if someone had leaned over and spoke directly into my ear. Sixteen-year-old Marshall Seaver is looking forward to a great summer with his best friend, Cooper Foley, when Cooper is busted for scalping tickets and sent away to the family cabin. Life has been rough for Marshall since his mother died. Once in frustation, he even smashed a small, golden ball she left him, resulting in a pool of blodd that somehow disappeared when he called his father. Does that have anything to do with the strange events that begin when his father leaves on a business trip? How about the odd circular designs he sees in spilled cocoa powder, the breezes in closed rooms, or, worst of all, the death's head drawing called "Gravedigger," done by Marshall himself, that appears to pursue him? Terrified, Marshall flees to join Cooper, only to discover that Cooper is missing. This lengthy fantasy, full of twists and turns, keeps the reader working to unravel the illusive plot line while Marshall flirts with death, dragging various characters along with him. Marshall, the only developed character, is an older Harry Potter without super powers but with a best friend and an incipient love interest in Cooper's sister Sydney. Names are different, but the pace and events of the novel seem familiar. 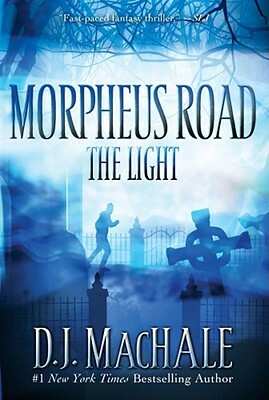 MacHale, known for his bestselling Pendragon series, beings another series in this open-ended novel. Undoubtedly readers can expect more adventures of the supernatural kind. Book One of this new trilogy grabs the reader immediately and never lets go. Marshall, an unassuming guy, lives vicariously through his adventurous best friend, Cooper. When Cooper is taken away after getting into too much trouble, and Marshall’s dad goes out of town, strange things begin to happen. His drawings of the supposedly imaginary Gravedigger seem to come to life and attack him. Marshall and Cooper’s older sister go in search of Cooper and unwittingly become ensnared in a dangerous nightmare. They learn that Gravedigger was just a small danger compared to what lies ahead. Marshall learns that he must locate items required by a creature much more evil and demonic. The use of foreshadowing will keep readers engaged as they learn that the end of this novel is just the beginning of Marshall’s quest. This high-octane action adventure will fly off the shelves and have students begging for the next installment.